All transactions are safe and secure with a reliable history in online purchasing behind each of our associates. 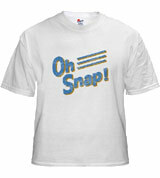 Buy the Joy Oh Snap t-shirt to own My Name is Earl clothing and merchandise. The NBC My Name is Earl t-shirt on the left displays the popular Joy Turner quote, "Oh Snap!" from the TV series. Pair it with an Earl logo design tee. The TV show's main character, Earl Hickey, believes that if he does good things, then good things will happen to him. He embraces this idea as he is lying in a hospital bed after being hit by a car, which is when he loses a $100,000 lottery ticket. He believes Karma will bring it back to him. In addition to the Joy Oh Snap tee above, browse the My Name is Earl Clothing Gallery for more apparel like men's and women's clothes, kids shirts or hoodies.